COULD YOU SURVIVE ON YOUR OWN, IN THE WILD, WITH EVERYONE FIGHTING AGAINST YOU? Twenty- four are forced to enter. Only the winner survives. Ok, So I just finished the most amazing book! I couldn't put it down! I even brought it to church and was reading it under my bag during church...I'm still waiting for the lightening bolt to strike. I called my sister (who sent me the book) immediately after finishing today, and I was rambling on at super speed to her about how much I enjoyed it. I thought the characters were well developed and the setting was well described. I could really picture everything that was happening. I am in awe of how creative this story is. I loved it! I don't want to spoil anything for you, so I won't go into detail, but this is a must read! The sequels, Catching Fire and Mockingjay are out now, read my review! 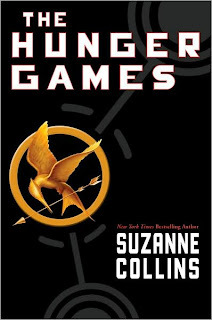 I absolutely LOVED Hunger Games...I am so excited about Catching Fire coming out. Look like you really loved it, maybe I'll check it out. Thanks for that.